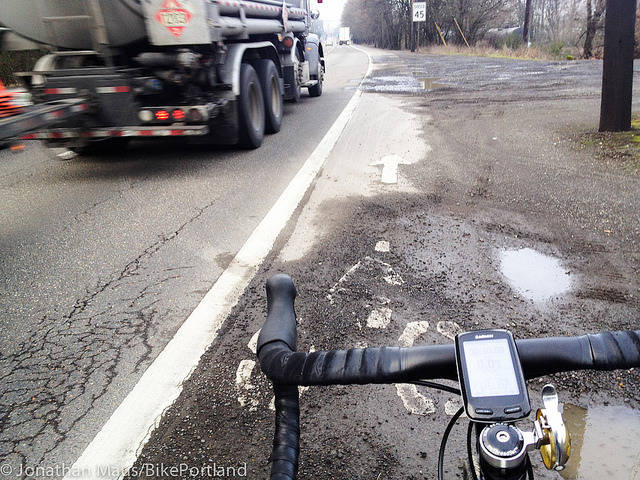 US 30 will be repaved this year from the Fremont Bridge to the St. Johns Bridge. Local cycling activists Scott Kocher and Ted Buehler are leading a “Transport Your Activism” Ride this Saturday morning. Feb 23. We’ll meet at Food Front Food Co-op at 9:00 on 24th and NW Thurmon, roll out at 9:30 sharp. Go up to the St. Johns Bridge, and possibly all the way to the Sauvie Island Bridge, then return to Food Front at noon. Then compare notes, write up notes somewhere near Food Front until 1:00. And a more comprehensive list of major projects that need to be done, like adding a pedestrian/bike crossing at the traffic signals leading to the St. Johns Bridge. We’ll be close to busy truck traffic the whole time. I’ll bring visi-vests for anyone who wants them. We’ll need to be careful, and keep ourselves off the roadway when stopped.